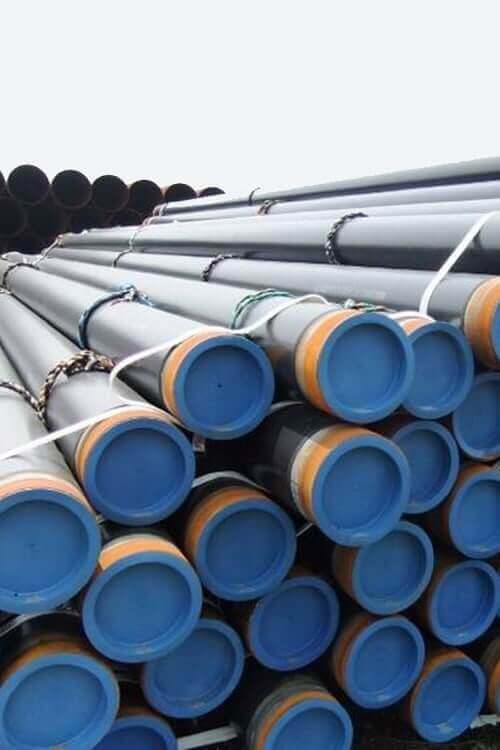 ASME SA672 Electric-Fusion-Welded Steel Pipes for High-Pressure Service at Moderate Temperatures | ASME SA672 CS EFW Pipes | ASME SA672 EFW Pipes | ASME SA672 Pipe | Carbon Steel EFW Pipe Exporters | ASME SA672 Carbon Steel EFW Pipes Suppliers | IBR approved Carbon Steel ASME SA672 High-Pressure EFW Pipes Traders | Carbon Steel EFW Pipe in ASTM A672 / ASME SA672 Grades A45, A50, A55, B55, B60, B65, B70, C55,C60, C65, C70, D70, D80, E55, E60, H75, H80, J80, J90, J100, K75, K85, L65, L70, L75, N75 in Class 10, 11, 12, 13, 20, 21, 22, 23, 30, 31, 32, 33, 40, 41, 42, 43, 50, 51, 52, 53, 70, 71, 72, 73. ASME SA672 Pipes has great specifications they are said to be electric fusion welded steel pipes that have filler metals added that are fabricated from pressure vessel quality plates that are several analyses and strength. These are the pipes that are suitable for high pressure and services at atmospheric and low temperature. The heat treatment that is being provided does not require attaining any desired properties that are applicable to the code requirement. They also provide you with additional testing for the examination desires. ASME SA672 Pipes are cover pipes that are 16in. (405 mm) as its inner diameter and it has ¼ (6.4mm) as it wall thickness. These are the pipes that are mainly used for power plants like oil, gas ship, and boilers. These are the pipes that are highly appreciated for its durability, corrosion, and dimensional accuracy. These are the pipes that are available to you in various grades and class so that they can give you best services and best quality. There are many industries dealing with the ASME SA672 Pipes as these pipes have great use in construction industries. So therefore according to the requirements of the people, they are engaged in offering people pipes that are of different shapes and size according to their requirements. They also help you in supplying superior quality product. They are made from the best-experienced manufacturers. They are well tested and certified. At last, the picking of these pipes is also being done in the best way that is in wooden boxes so that no further damages can be seen at the last stage. Standard Size ASME SA672 EFW Pipes Supplier, ASME SA672 Carbon Steel Electric Fusion Welded Pipes Stockist in Mumbai India, ASME SA672 CS EFW Piping, ASME SA672 GR C70 EFW Steel Pipe, SA672 C60 Pipe, Carbon Steel ASME SA672 EFW Pipes Exporter, ASME SA672 Welded Pipes, ASME SA672 EFW High-Pressure Pipe Stockholder, ASME SA672 C65 Pipe in Class 12 / 22 / 32, ASME SA672 Grade B60 / B65 / B70 EFW Pipe. ASME SA672 EFW Pipes Class Class 10, 11, 12, 13, 20, 21, 22, 23, 30, 31, 32, 33, 40, 41, 42, 43, 50 ,51 ,52, 53, 70, 71, 72, 73.